The concept of lugging portable, one-man rafts isn’t new to the world of adventure sports. Backpackers in the western United States and Alaska have been using this versatile mode of river transportation for decades. But as packraft technology has continued to improve in the past few years, so, too, have the possibilities for multisport river adventures. I have one person to blame for tempting my adventure itch with a packrafting trip. New River Bikes owner Andy Forron. A few months back, a photo popped up on my Facebook feed. 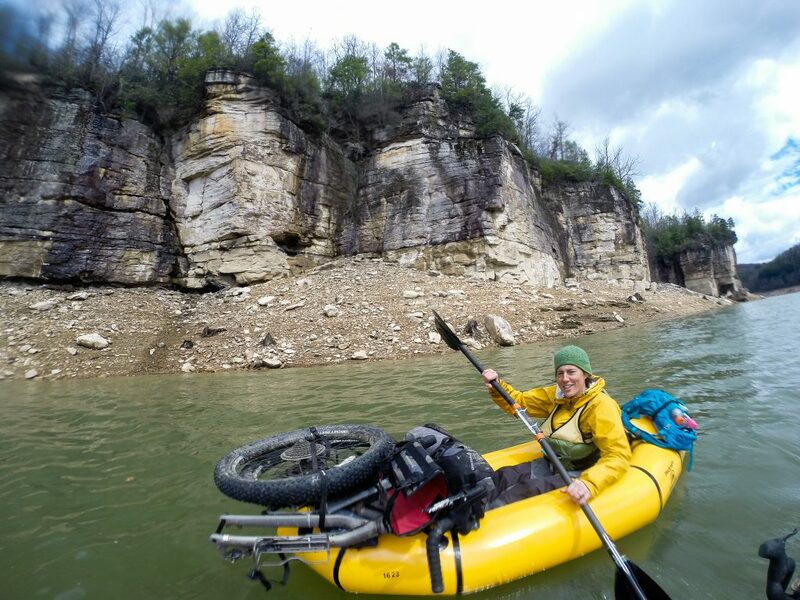 It was a picture of Andy’s bike partially disassembled, strapped to the bow of a peculiar looking raft, floating against a backdrop of the New River Gorge Bridge at dusk. “Time for a whole new level of multisport,” the caption read. A paddler and cyclist at heart, that’s when I knew I wanted in on this packrafting thing. It was the perfect marriage of two worlds I never expected could overlap. In the past, I had certainly seen plenty of inflatable kayaks on the river, but never a packraft and definitely not a packraft with a bike secured to its bow. 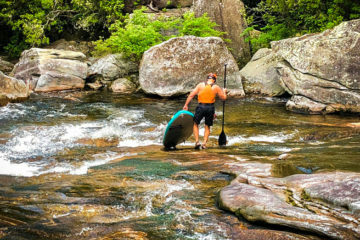 If these one-man rafts were so popular elsewhere in the country, why not here in the Southeast and Mid-Atlantic where the paddling season is longer and warmer? 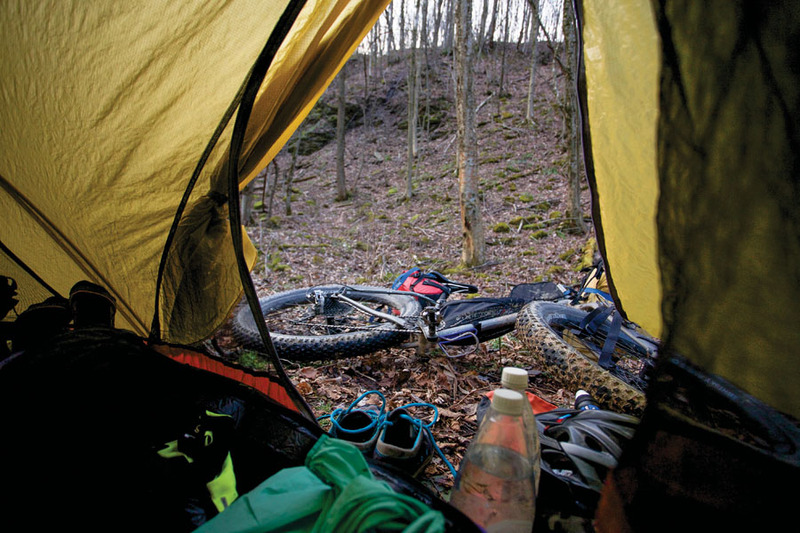 Thus, the idea of a bikepacking packrafting (say that five times fast) trip was born. 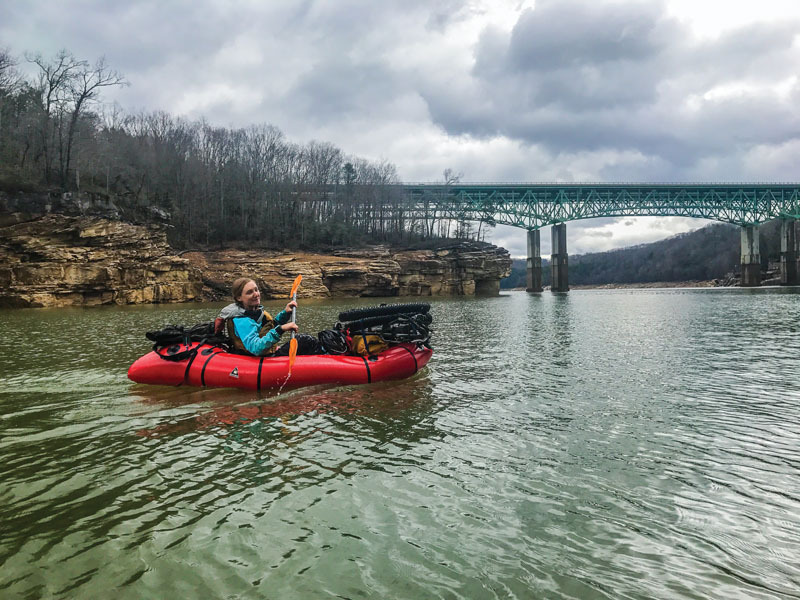 After securing a couple of Alpacka packrafts from Packraft America for myself and our third partner-in-grime, Annie Simcoe, the only thing left to figure out was the route. I’d like to say that we spent hours together pouring over maps, orchestrating the perfect three-day, two-night ride-to-float, but the fact of the matter is that Andy, our de facto local and guide, literally threw the route together at 11 o’clock the night before. Of course, Andy had been scheming this trip long before I ever approached him about it, so plotting the actual route on a GPS was a mere courtesy to Annie and me. The plan? Ride from Fayetteville to Richwood, W.Va., on over 100 miles of low-traffic country roads, gravel roads, and rail-trails until we arrived at the banks of the Top Gauley. 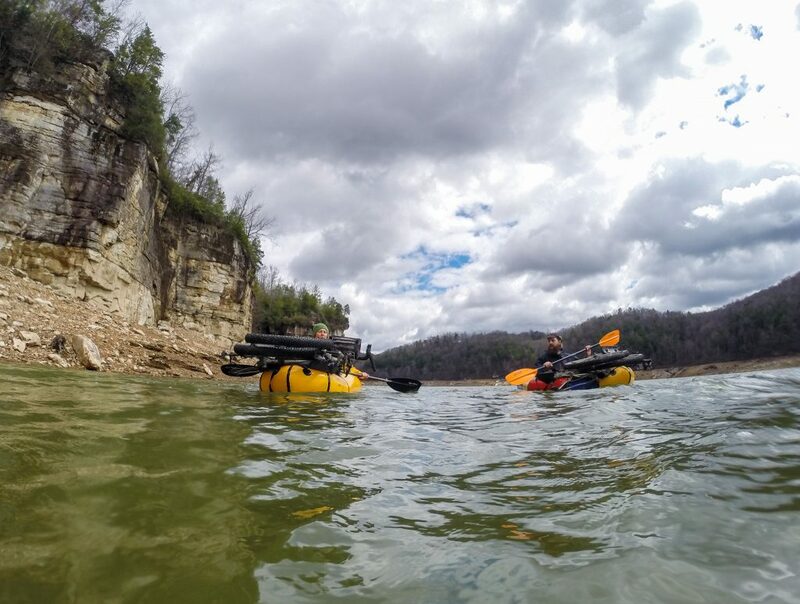 From there, we would inflate our rafts and head downstream to where Route 19 crosses Summersville Lake, at which point we would pack up the rafts and ride 20 breezy miles back to town. Like any good adventure, our trip was destined for trouble before we even left. More than four inches of rain had dumped on southern West Virginia in the days leading up to our departure, and more was expected on day two of our journey. But when I finally mounted my loaded bike after a sheet-twisting sleepless night, rain was the last thing on my mind. The morning dawned crisp and cool. We rode single file over the New River Gorge Bridge, which hummed with the morning commute. As I gazed at the New flowing big and brown below, it was hard to believe that this trip had been the result of Andy’s packraft picture—the raft, the bike, the bridge. It was all unfolding beneath my very pedals. Soon, we veered onto Lansing Road and away from the screaming semis on Route 19. Within the hour we were cruising with ease along the loose gravel of the Meadow River Trail. When we popped out of the forest, giddy with glee, we were met with the sobering sight of Nallen, a now mostly abandoned community that had been all but wiped away in last year’s historic flood. Dates and high water lines were scratched above the blown out windowpanes of singlewides, a somber homage to a still-fresh calamity. We started climbing almost immediately and, with the exception of a few downhill reprieves, continued climbing well into the afternoon. Neighborhoods gave way to bucolic farmscapes. We passed through the unincorporated community of Nutterville, which was nothing more than a pocket of homes and one-room churches. Over the course of three hours, the only traffic that passed was a rusty tractor and a Jeep. By early evening, we had arrived in the old coal town of Quinwood, population 285. 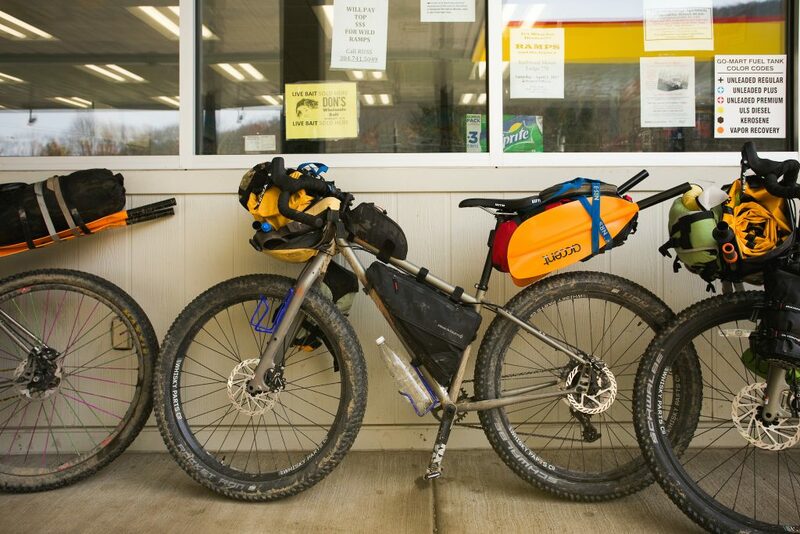 With 30-odd miles yet to go, we restocked our water and candy supply at the B&M Grocery. Two guys in camo lingered outside by a four-wheeler. Feeling self-conscious in my lycra and neon yellow gloves, I hung by the bikes while Andy asked for better directions to the Beech Ridge wind turbines. Their input proved invaluable, shaving off eight roundabout miles of even more climbing. As the sun began to settle below the trees, we finally crested Beech Ridge. 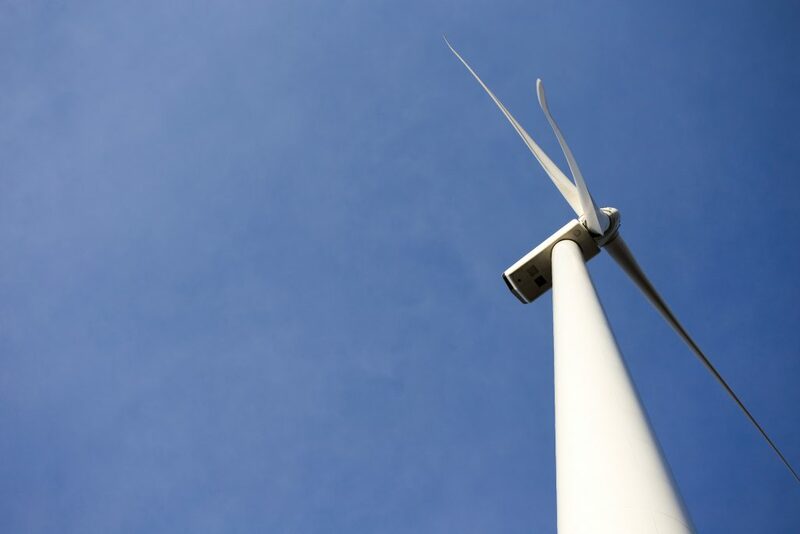 For a while, we marveled at a whirling wind turbine looming some 400 feet above us. Its breeze cooled the sweat on my back. We pedaled on, landing at a flat patch of forest along an overgrown logging road to camp for the evening. One of the many wind turbines atop Beech Ridge. / Photo by Jess Daddio. Camp, day one. / Photo by Jess Daddio. Braced for rain, we woke to a pleasantly dry and warm day. My legs felt used, but not spent. The next 11 miles were mostly downhill as we followed the Cherry River into Richwood. Had I known what the afternoon would bring, I might have had a beer when we pulled into the Mountaineer Mart. Gas station resupply in Richwood, W.Va. / Photo by Jess Daddio. Annie diggin’ for a snack along the Cherry River. / Photo by Jess Daddio. 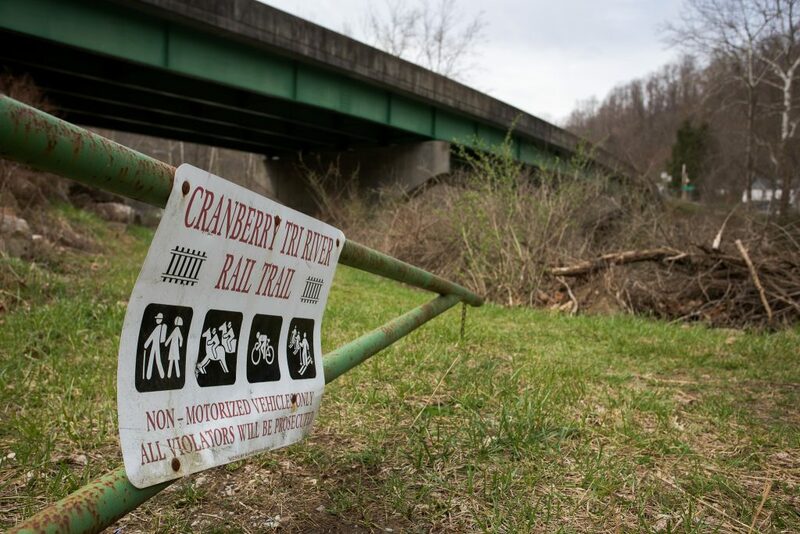 Cranberry Tri River Trail. Note the trail user signs. / Photo by Jess Daddio. By 2 o’clock, the rain was falling in heavy sheets. We had long turned off WV-55 at the confluence of the Cherry and Gauley Rivers and onto an access road of questionable integrity. At first we passed by summer camps and rental homes, but before long, it was just the three of us, our bikes, and the raging river to our right. One by one we navigated around mud puddles ranging in size from small potholes to lane-wide craters. The going was slow, but enjoyable. We were wet already—what difference did splashing through a mud puddle make? But the overgrown rail bed continued to deteriorate. Bigger, deeper mud craters impeded efficient riding for miles on end. The soul sucking, muddy sand pits stopped my bike dead in its tracks and I fell twice in knee-deep water the color of heavily creamed coffee. The author at one of many creek crossings along the Top Gauley. 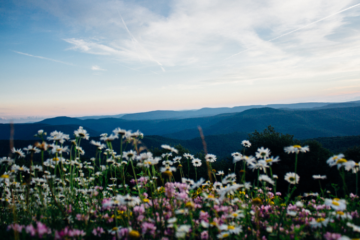 / Photo by Annie Simcoe. The “road,” if you can call it that, was littered with leaves and fallen branches. I desperately looked to the river in hopes of finding a nice beach to launch our packrafts from, but the bank was steep, and the swollen Gauley River flowing high in the trees. We trudged on, slogging through stream crossings and picking our way over long stretches of baby head rocks. Eventually, we hit the literal end of the line. To our right was an unfortunately trashed, but level, riverside campsite. To our left, an impossibly steep four-wheel “road” (I use that term loosely) that climbed up and out of the river valley. We had a decision to make—float into the unknown on a flooded river, or hike-a-bike out of there. It was nearing dinnertime, and with no idea of what lay downstream, we hopped off our bikes and started to climb. For a mile-and-a-half, we pushed our 50-pound bikes up 700 feet out of the valley. In many places, the road was completely washed out, and in others, so rocky and steep as to hardly warrant being called a road. 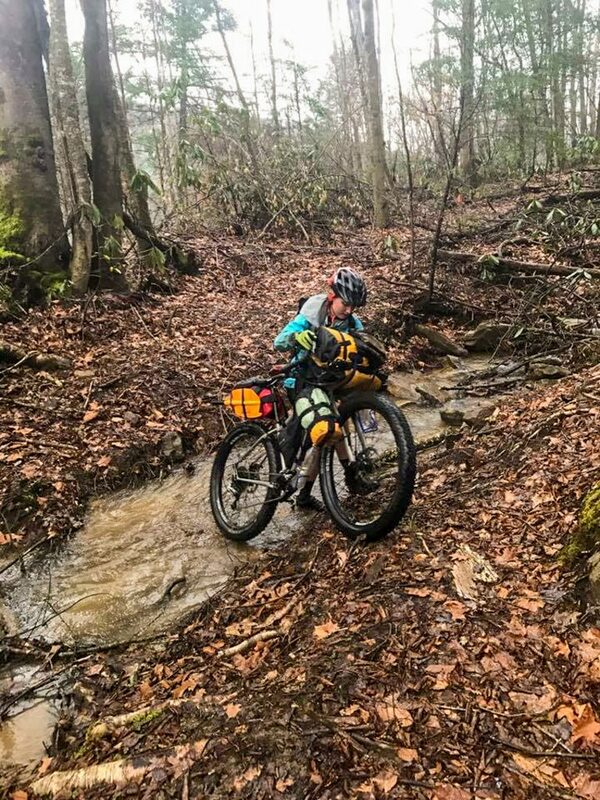 When we reached rideable terrain again, we mounted our bikes once more with a weary determination to camp as close to Summersville Lake as possible. Thankfully, the rain clouds parted. As we cooked dinner and reflected on the 100 miles we’d traveled so far, the gray sky melted to night in a brilliant swirl of stormy mauve, the color of my bruised legs. During the night, a thunderstorm rolled in. Even with my eyes closed I could see the bright flashes of lightning strike the ridgeline. A light drizzle still spat intermittently in the morning, but we weren’t concerned with being wet anymore. It was our final day. Within minutes of leaving camp, I got a flat tire and Annie realized her paddle was missing a connector piece. No matter. After two days of lugging packrafts and paddles and PFDs up and over mountains, we were determined to paddle, no matter the obstacle. We changed the flat, stabilized Annie’s paddle with some tent stakes and zip ties, and proceeded to load up the packrafts. Annie (left) and Andy (right), pre headwind-of-death. / Photo by Jess Daddio. Annie smiling big, despite paddling with a makeshift shaft. / Photo by Jess Daddio. Finally, we were floating. It wasn’t the downriver paddling adventure we had in mind, but still, we were on the water. Sandstone cliffs towered above us, reminding me of how very small we are compared to the natural world. And if those stoic rock formations hadn’t been enough of a reminder, the wind most definitely was. For two hours, we paddled into an angry headwind that only increased in intensity around every bend. The lake’s normally placid water lapped up and over the tubes of my packraft (which is not self-bailing). It took every ounce of dwindling energy I had to keep paddling. Stopping was not an option, for any lapse in forward motion would give the wind a chance to push us back. The author, relieved to finally be floating. / Photo by Annie Simcoe. Parched, spent, and nearing the limits of my patience, we finally landed at a beach just above the Summersville Dam. In an hour we had assembled our bikes again and were headed down the road. Were it not for the hot and noisy ride along Route 19 back to Fayetteville, I might have reveled more in our multisport success. After all, the packraft truly did add another element to the bikepacking adventure. But in the moment, I had three things on my mind—pizza, root beer, and a dry set of clothes. WANNA TAKE UP PACKRAFTING? READ ON!